The eagle-eyed Flickr watcher might have noticed from the last Sunday’s pictures Unilever commission for the Turbine Hall at the Tate Modern. It’s been undertaken by Rachel Whiteread. 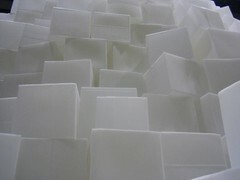 According to the Tate site, ‘she has created a gigantic labyrinth-like structure, entitled EMBANKMENT, made from 14,000 casts of the inside of different boxes, stacked to occupy this monumental space’ [source]. Browsing Flickr tonight I found many other people who had taken interesting pictures of the exhibition too. This entry was posted in Life Rants Updates 2005 on November 25, 2005 by Jon. The news that George Best’s hours are numbered is tragic. One of the greatest football of all time is fighting for his life at a hospital in London. He’s spent years battling alcoholism but couldn’t give up the drink even after a liver transplant. In a cruel twist of fate the final moments may be spent on the day the UK liberalises it’s drinking laws and bars can be open for longer. He will leave a great football legacy. Maybe there will also be a lesson for the rest of us when it comes to drinking and we won’t all become victims of alcohol. This entry was posted in Life Rants Updates 2005 on November 24, 2005 by Jon. I meant to write about coffee last week when it was on my mind. There was a day, Monday – I think, where I had some time to kill before meeting PY after work. So I went into Cafe Nero and ordered myself a regular Latte. Nice, warm coffee. Then I wandered around some shops and then went into Costa Coffee and ordered another Latte. This time the taste was totally different. Unfortunately, I don’t have the words to hand to describe quite how different the two drinks were. There was a startling difference between two cups of coffee. The Costa drinks was much less bitter and had a much fuller flavour. I was blown away as I have never noticed such differences between two coffees before. I blame the thick stuff we drink at work for dulling my taste buds. Anyway, the leaflet in Costa says, ‘Others think their beans are fine after a 7-minute blast. Our beans need a full 18 minutes at precisely 230 degrees to bring out every bit of flavour – and we always make sure they get it’. It appears to be true. My regular coffee show has just changed. Most people don’t even know what a rootkit is, so why should they care about it? 2005: Most people don't even know what a rootkit is, so why should they care about it? This entry was posted in Life Rants Updates 2005 on November 23, 2005 by Jon. You know I might not agree with The Sun on many things but I really do agree with their campagn to try and save Christmas. Christmas is a fun celebration and should be kept that way. What sort of residents complain about charity Christmas lights?. According to this story it’s the grumpy residents in Rayleigh, who demanded the local council scrap a popular charity light display. So, questions answerd in The Sun: Christmas is good. Questions unanswered from work: why do some Americans have a problem with Santa Claus? Question answered today: Thanksgiving is a religious festival in origin. Questions answered from this year’s BBC Children In Need: Daniel Powter wears a hat all the time. This entry was posted in Life Rants Updates 2005 on November 18, 2005 by Jon.